Fauré was a pupil of Saint-Saëns and after having been organist at several churches in Rennes and Paris he succeeded Eduard Massenet as teacher at the Conservatoire Nationale de Paris and serving as director from 1905 to 1920. Musically he is considered as standing between Cesar Franck and Claude Debussy and his output which often avoids sharp contrasts is comparatively small. His most famous works are the opera Pénélope, incidental music for Maeterlinck play Peléas et Mélisande, the ballet suite Masques et Bergamasques, some chamber music, a Requiem and a multitude of works for one or two pianos and songs. Felderhof studied at The Amsterdam Conservatory violin with Felice Togni and Hendrik Rijnbergen and theory and composition with Sem Dresden taking his diploma exams in 1931 and 1933. Among his works are a Marcia Sinfonica, a sinfonietta, a suite for flute and orchestra, a rhapsody for oboe and orchestra, chamber music and piano works. The piece was written in 1959 for the famous Dutch pianist and composer Cor de Groot with whom Felderhof often performed as a violinist. Felton attended the public schools and graduated from the Central High School. His father was a talented musician and a well known performer upon the concertina, playing lengthy selections for Wagner, Verdi, Gounod, etc., from memory. Already as a child William Felton began making little tunes so that at the age of five he attracted the attention of some musical people. He was placed under the instruction of William C. Schwartz in piano, and H. A. Matthews and Henry Houseley in harmony and composition. After spending some time as the musical director of one of the largest photo play houses in the United States he resolved to devote all of his time to musical composition. Although still a young man he has some fifty compositions to his credit, many of the most successful being for piano. Felton's musical inspiration is entirely sane and dwell balanced, without any foolish striving toward ultra-modernism. Consequently, his work grow and develop upon rational lines. His melodies are pleasing and with a natural appeal, and his harmonies are tasteful and well diversified. Among his larger works are the Concert Polonaise and Second Waltz Caprice. Among the smaller characteristic pieces, Twilight in Autumn, Blowing Bubbles and Sunday Morn should be mentioned. Of pieces in lighter vein are his successful marches, The Color Guard and Passing Parade and The Wedding Procession, which is published both for two and four hands. Fibich was born into a well-to-do family and enjoyed a more orthodox musical training than his colleagues Smetana and Dvorak. The years 1865 to 1867 he spent at the Leipzig Conservatory where he had Richter as teacher in harmony, Jadassohn in counterpoint and Moscheles in piano. In 1868 he went to Paris for a year to study at the Conservatoire and he finished his education with Vincent Lachner in Mannheim after which he returned to his home land (1870). After a teaching post in Vilna he was appointed second conductor of the National Theatre and in 1878 he became conductor of the Russian Church in Prague - a post he held until 1881 when he decided to relinquish all appointments to devote his time entirely to composing and living a fairly uneventful life and not much is known about his last years and his death in 1900. Fibich composed in all genres: 7 operas, 4 melodramas, Choral works (a Missa Brevis from 1885), Orchestral works (3 symphonies, 4 overtures, a suite and 7 symphonic poems). Lesser known are his rather few chamber music works some piano works and not more than a hand full of songs. In his symphonic works Fibich shows an ability to evolve a whole symphony from a tiny motive (like Beethoven) and this makes him unique i Czech music. So does his harmonic and dynamic originality which sets him in class of his own. Fink was son of a priest and sang as a chorister at Naumburg. after taking his exams from the Latin School there and some attempts to become a musician he decided to study theology and history in Leipzig from 1804 to 1809. But at the same time he worked on with his musical education and published his first compositions and a very thorough desertion about time, measure and bars in music. From 1810 he was helping priest in Leipzig but worked at the same time as a journalist and redactor of great renown and receiving several honoree acknowledgements for this. Soon music took over completely and from 1838 to 1843 he taught at the University of Leipzig gaining a honorary doctor's degree in 1841 and becoming Professor of Music in 1842 and being honorary member in 1847 of Gesellschaft der Musikfreunde in Vienna, Leipziger Euterpe and Mannheimer Musik- and Pressburger Church Music association. He is remembered for his writings on music history and theory, and his collections of secular and religious songs. As a music historian Fink showed himself from a sound evolutionary rather than revolutionary point of view gaining much respect from his writings and essays. Fink has written an abundance of salon pieces and educational studies but the greatest part of his output are songs - mostly of religious nature - in all amounting to 343 opus numbers - among these Musikalischer Haus­schatz (Leipzig: 1843) and Die deutsche Liedertafel (Leipzig: 1846). His first education was as an organist and he served for six years at the St. Adalbert's Church after which he was appointed professor at the Organ School in Prague. After he married in 1888 he followed his wife to Hamburg where he was professor at the Conservatory for ten years and when she was engaged to sing in Vienna he followed her there. 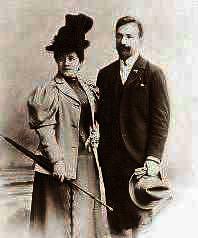 His wife was the singer Berta Foerstrová-Lautererová (1869-1939) who was Mahler's leading dramatic soprano - especially in Wagner - first in Hamburg and from 1901 at the Vienna Court Opera. In Vienna Foerster became professor at the New Conservatory and music critic at Die Zeit until the revolution in 1918 when the couple returned to their native land - he as professor of composition at the Prague Conservatory and from 1922 of the Master School there. He has composed in all genres; operas, church music, 5 symphonies, 2 violin concertos, chamber music, numerous works for piano and songs. Not many of his works are heard outside his own country today - except perhaps for his 4th symphony Easter Eve. He was the first important composer to be educated entirely in America and he was the first to receive a master's degree in music in USA. After showing signs of great musicality he was given lesson in piano very early and when he was 15 he became pupil of Stephen A. Emery at the New England Conservatory in Boston. In 1874 he graduated from the Harvard University and started taking lesson from B. J. Lang (piano) and John Knowles Paine (composition). Four years later he was appointed organist at the First Unitarian Church of Boston a post he held for 32 years at the same time composing choral music, orchestral works and chamber music. Foote was considered the Dean of American Composers during the first two decades of the twentieth century and was a leading member of a group of composers known as the Boston Six or the Second New England School consisting of John Knowles Paine, Horatio Parker, George Chadwick, Edward MacDowell, Amy Beach, and Arthur Foote himself. He is considered to have written the first substantial body of indigenous concert hall, or classical, music in America. Lucas Foss was born in Berlin as Lukas Fuchs and was soon recognized as a child prodigy. He began piano and theory lessons with Julius Goldstein (Herford) in Berlin at the age of six. His parents were Hilde Schindler and the philosopher and scholar Martin Fuchs. 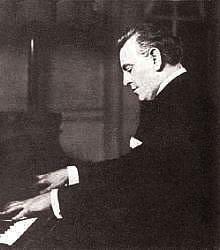 In 1933 He moved with his family to Paris where he studied piano with Lazare Lévy, composition with Noël Gallon, orchestration with Felix Wolfes, and flute with Louis Moyse. In 1937 he moved with his parents and brother to the United States, where his father changed the family name to Foss. Here Lucas studied at the Curtis Institute of Music in Philadelphia, with Isabelle Vengerova (piano), Rosario Scalero (composition) and Fritz Reiner (conducting). At Curtis, Foss met The classmate Leonard Bernstein and a lifelong began a lifelong friendship was formed. Bernstein who later described Foss as an "authentic genius." In 1961 Bernstein conducted the premiere of Foss's Time Cycle, while Foss would conduct the premiere of Bernstein's Symphonic Dances from West Side Story. Foss also studied with Serge Koussevitzky (1939 to 1943) at Tanglewood Music Center and composition with Paul Hindemith at Yale University (1939 to 1940). In 1953 Foss was appointed professor of music at UCLA in 1953, thus replacing Arnold Schoenberg. There he founded the Improvisation Chamber Ensemble, which made its Boston debut in 1962. He founded the Center of the Creative and Performing Arts in 1963 while he was at the State University of New York at Buffalo. From 1963 to 1970 he was music director of the Buffalo Philharmonic Orchestra and from 1971 to 1988 music director of the Brooklyn Philharmonic. From 1981 to 1986, he was conductor of the Milwaukee Symphony Orchestra. He was a professor of music, theory, and composition at Boston University beginning in 1991. He is the best known representative of the so called Boston school and in 2000 he was awarded a Gold Medal by the American Academy of Arts and Letters. Lukas Foss, suffered from Parkinson's disease in his final years and died at his home in Manhattan aged 86, of a heart attack. For a composer whose royalties would today have brought him millions Foster was a complete tragedy - dying in a hotel with only 38 cents in his pocket and a note saying Dear friends and gentle hearts. His brother Henry described the accident in the New York theater-district hotel that led to his death: confined to bed for days by a persistent fever, Stephen tried to call a chambermaid, but collapsed, falling against the washbasin next to his bed and shattering it, which gouged his head. It took three hours to get him to the hospital, and in that era before transfusions and antibiotics, he succumbed after three days. For Danish readers it should be remembered that while Oh! Susanna and De Campton Races are easily recognized as American songs one of the so-called most typical Danish summer songs, Se det summer af sol over engen is in fact Stephen Foster's melody, Gentle Annie. Frey was a student of Clara Schumann, Immanuel Gottlob Friedrich Faiszt (1823-1894) and Brahms (as far as you could claim to be a pupil of Brahms). From 1887 to 1893 he was musician to Prince Alexander of Hesse after which he in 1902 became Professor of Music of the Syracuse University. Friedman had his general musical education at Crakow and was at the same time a piano student of Flora Grzwinska before going to Vienna to join the classes of Leschetizky. At first he was turned down by the great teacher and told to go find another job but he stayed on for four years becoming one of his greatest pupils. At the same time Friedman took lessons in composition with Guido Adler in Vienna and Hugo Riemann in Leipzig. After his debut he toured all over the world gaining fame and esteem everywhere as one of the truly great and original virtuosos with a colossal technique and a easily recognizably touch and grand style. His more than 90 compositions are mainly for the piano and his miniatures were once very popular. At the same time his editions of Chopin's works for Breitkopf & Härtel and of Schumann's for Universal Editions became standards which still are being used. Fortunately his mastery is preserved through his many recordings - among these are also two rather interesting interviews where Friedman speaks (in a charming but most extraordinary English) about Paderewski (as musician, personality and statesman) and about Chopin. Fumagalli came from a very musical family - there were in all four brothers who were musicians and composers: Disma (1826-1893), Adolfo, Polibio (1830-1901) and Luca (1837-1908). 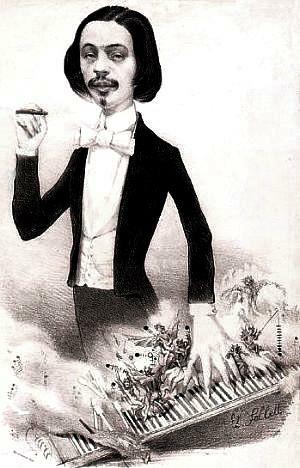 Adolfo attended the Milan Conservatory as a pupil of a well-respected teacher Angeloni and made his debut as a pianist in 1848 before the Milanese public making some stir. Now he embarked upon a tour becoming a famous and brilliant fantasy player - Turin, Paris, Belgium and Denmark - before returning to Italy in 1856. Upon his return the piano makers' firm Erard sent him one their pianos (there is obviously nothing new about this kind of promotion 'stunts'). On 1st May he held a concert but after this he suddenly fell ill and three days later he died - presumably from cholera. Although respected by the critics (one French critic called him - overreacting a little - the first serious pianist from Italy) and famous with the public he was no real sensation. But when he introduced his left-hand pieces (one year before his death) he became just that kind of sensation and stunned everybody. Although a little frail or perhaps even feminine looking he had fingers of steel which astonished the audiences. Apart from his left-hand pieces Fumagalli composed a lot - all of drawing-room nature: fantasies on opera tunes, capriccios etc. One piece of his Les Clochettes op. 21 with orchestra became very popular in his days. These are (for good reasons) all forgotten today - and he is solely remembered for his left-hand works - if at all. His brother Disma Fumagalli went quite the other way - he obviously couldn't get enough hands on the keyboard - and he wrote a Divertimento over themes from Verdi's Il Trovatore for eight hands on one piano. Apart from good technique this piece requires good friendship and lot of deodorants. As I have stated elsewhere, there have been several explanations for playing with the left hand alone. I don't think I have mentioned smoking a cigar, but perhaps this was the real reason for Fumagalli's pioneering works for the left hand. After all - Fumare is the Italian word for to smoke. The small devils on the keyboard suggest that he is playing the Robert le Diable Fantasy. Warning: Don't jump to any conclusion once you notice that on both pictures his left eye is larger than the right one. Trust me - that is quite normal - every artist knows that. Grande Fantasie sur Robert le Diable de Meyerbeer op. 106 (Ricordi) Dedicated to Franz Liszt who himself wrote a similar fantasy of much greater musical value - but of course for two hands. Furlani was engaged as chamber musician at the Ottoman Court just like Gaëtano's brother, Giuseppe Donizetti (1788-1856).